17 2014 year in June and blooming iris Valencia, The third largest Spanish city began its work shop retail chain IKEA. This is a dynamic and diverse city. In order to stop even for a moment looking at him and attract the attention of people for such an event as the opening of a supermarket, ikeevtsy resorted to the use of the original outdoor advertising. This is a very effective marketing move: on the coverage and effectiveness of outdoor advertising in their performance is second only to television formats. 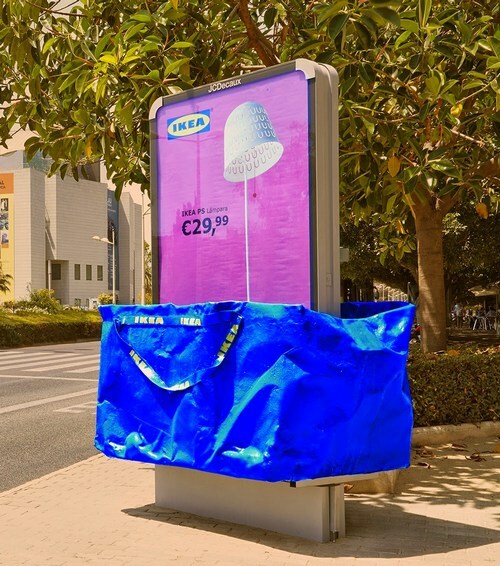 IKEA assistant in the implementation of creative ideas become company JCDecaux - A recognized leader in the outdoor advertising industry. They were provided roller stands urban format. All of them showed a constant successive images of headings from the widest range of hypermarket in Valencia. Sami stands placed in huge blue branded bags IKEA logo, thus as if to say, looking at them, man, "Come, buy and take away." Developers using outdoor advertising alone stands is not limited. As part of this campaign were used as bus shelters bus routes. They have also been applied to the image the company's products collected into a single meaningful composition.